As I mentioned in my review of The Only Game in Town, Blu-ray distributor Twilight Time is enjoying the super sounds of the ’70s with their latest release cycle. I may have been blase about Only Game, but that’s because I hadn’t sat down to watch Hard Times. 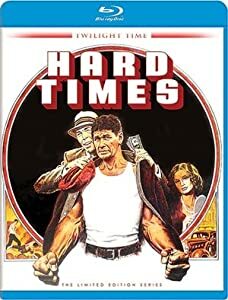 Hard Times is my first foray into the bare-knuckle world of Charles Bronson (I know he’s in The Great Escape, but he wasn’t the lead) and director Walter Hill. I expected a mindless actioner where a meathead punched people for 90 minutes, but what Hill delivers defies convention. A story of a Christ-life drifter and his motor-mouthed promoter explores masculinity, poverty, and the desire for catharsis through violence; Hill’s love for fellow director Sam Peckinpah is evident, and I was ready to hold tight and go along for the ride. Set during the Depression, small-town pick-up fight promoter Speed (James Coburn) believes he’s found a man who can take him to the big-time. Chaney (Bronson) is a quiet drifter hoping to make some money in a short amount of time. The two decide to join together to enter the world of bare-knuckle brawls and walk away with a fortune. The movie is set in 1933, laughable since the fighting styles don’t mesh with the time period. However, it creates a sense of desperation needed to propel Chaney and Speed into each other’s lives. Times are literally hard, and one has to be brutal about how they will find their next meal. Chaney doesn’t have any reason to do what he does other than to make money to ensure his survival. He must be physically hard as well, fit to take a punch in order to navigate the waters of this difficult time period. By the end, you leave Hard Times with a sense of hope; hope that Chaney’s can-do attitude (via his fists) have helped him illustrating the American spirit. This may be sacrilege, but I found a stronger kinship to the time period than I felt with The Sting. Both movies are fantastic and probably shouldn’t be compared, but Hill sets-up the period and lets it blossom throughout the film. James Coburn lends that added air of authenticity as the fast-talking Speed, the exuberant gambler who can’t let go of a long-shot. Coburn has littered the blog, of late, and I’m not sure why that is; his movies always find a home here. Speed is a character I wanted to see more of because Coburn’s narcissism and natural exuberance shine through. Neither him nor Bronson are conventional leading men, but they’re true definitions of masculinity with their rough and tumble personalities and cool exteriors; they’re laconic and keep things close to the vest. Chaney is a man of few words – Bronson says less than 500 words throughout the movie – while Speed is literally a speedy effusion of them. For fear of the bromance becoming too much the script introduces a female love interest for Chaney. Jill Ireland (Bronson’s real wife at the time) is okay, but it’s evident that the script doesn’t favor her too much because she lacks any interesting characteristics. She’s the typical woman of the Depression hoping to blow out-of-town and start over, but other than that she’s set dressing. Fans of Bronson will want to know about the fight sequences. It’s sad to watch what fight scenes have become; filled with wire work, stunt doubles, or CGI. Being 1975 every painful punch, kick, or headbutt is filmed in all it’s excruciating glory. It’s mentioned on IMDB that Bronson did his own stunts, and if that’s true I wince for him because all the fights look painful. Hill keeps the camera steady throughout the brawls and either the actors did an amazing job blocking out the scenes, or they didn’t pull any punches. Men are getting hurt here, and you hear every slap of skin on skin. Chaney’s first fight sees him lay out a man cold with one punch, and I wouldn’t be surprised to hear that he connected with the guy. I may have said the fight scenes are incongruous to the time period, but they way these men attack only serves to prove their desperation. Twilight Time puts out another fabulous Blu-ray that’s beautifully rendered and doesn’t suffer from the audio problems that I found with Only Game in Town (it helped that subtitles were included here, as well). The only feature is the requisite isolated score, and Barry De Vorzon’s score represents the simple sounds of the time period; it’s worth a listen. Overall, Hard Times shouldn’t work but it’s an entertaining romp pinpointing the struggle to assert masculinity during periods of desperation. James Coburn and Charles Bronson make a formidable team, and Walter Hill cements himself as an action director whose work you might want to delve into. Great movie! Saw it not to long ago on TMC. But I was disappointed because there were some questions that needed to be answered. Where did Chaney come from? Where did he learn to fight like that? How did he get all that muscle? Also, apparently Speed and Gayleen broke up, but we didnt find out about that until the end of the movie. And I thought they still together. Just bits and pieces that were left out in my opinion. I have to wonder how much of that is intentional to convey the mysterious nature of Chaney; then again, I would have enjoyed developing Speed’s story more as he is the more compassionate member of the group. The lack of backstory on Chaney definitely is intriguing and sets him up as this mysterious drifter that ends up saving Speed; the love story definitely makes you question his past though. Thanks for reading! Very good film. I liked the fact that Chaney remains a cypher throughout the picture, and the perfunctory way Ireland’s character is handled somehow fits; Chaney just isn’t interested in her in any depth, any more than he is in anything else. I also thought Strother Martin’s character rounded out the Speed-Chaney relationship, making it a bit of an id-ego-superego situation. True, there’s really no overt romance created which I appreciated. It would have been so easy to force a sexual relationship or something between Chaney and Ireland’s character. In the end, they’re both seeking company. I do think that the exclusion of her would have allowed for a stronger bond between Speed and Chaney, but the movie’s good as is.